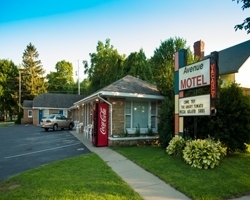 Despite its smaller size, the Avenue Motel boasts excellent service and is still a popular place to stay when visiting Ludington. All rooms have in-room coffee makers, air conditioning, wireless internet and cable TV. Some rooms with microwaves and fridges. Rooms can accommodate 1-5 guests. They are close to downtown, car ferry, marina, restaurants and beaches.